Born in 1965 in the city of Dzerzhinsk (Nizhniy Novgorod region), Russia. First cartoon was published in the newspaper “Moskovskiy Komsomolets” in 1983. In the beginning of 1990s he regularly contributed to such editions as “Vechernyaya Moskva”, “Kuranty”, “Literaturnaya Rossiya”, “Russkiy Vestnik”, “Sovetskaya Rossiya”, “Al-Kods”, “Ne mozhet byt”, “Federatsiya”, and since the middle of 1990s – to “Gazeta Rossiiskogo Biznessmena”, “Farmatsevticheskiy Vestnik”, “Domashniy Advokat”, etc. He worked as an artist at Russian comics-studio “KOM”. 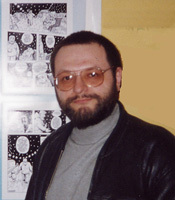 From 1989 up to 1991 he contributed to comics collections published by comics-studio “KOM”, such as “KomOk”, “КОМpositsiya”, “Fishes”, “Shtuka-Dryuka”. Personal album: “War with snow-mens”, М., 1992 (publishing house “Teatr”).